Aksalnik says she believes that this was RCMP policy not to speak to Inuit women. "Even though there were those interactions, they were going by that policy, not [getting to] talk to their biological father." Buller asks about the children born by RCMP fathers and Inuit women. Were they accepted by their families? Aksalnik reads QTC testimony from an Inuit woman with an absentee RCMP father. "I am an illegitimate child, and it is embarrassing. I was so close with my biological father, and when I learned that I had a white father, I was very agitated by it." Buller asks Davidee Aningmiuq if her centre's counselling services for inmates include women and girls. She says that it could, if it was requested, but it's primarily male clients. What type of counselling would that be? Buller asks. "Sometimes individuals just want a listening ear," says Davidee Aningmiuq. "Someone who can understand the stuff that they are going through... I do know that it's very important to speak your mother tongue when you are going through the counselling." Davidee Aningmiuq is asked about the centre's parent and family counselling services. She says it primarily teaches communication skills. "It's quite effective, because we can make it more culturally relevant," she says. Buller asks Davidee Aningmiuq how she would recommend elders are recognized for their work helping people with mental health issues. She references an elder who said "it seems like us elders' work is done underground." "For sure, there needs to be recognition of the elders that are providing the help," she says. "A lot of elders have volunteered their time for so long. Their knowledge, their wisdom. If we honour them, they are very appreciative." 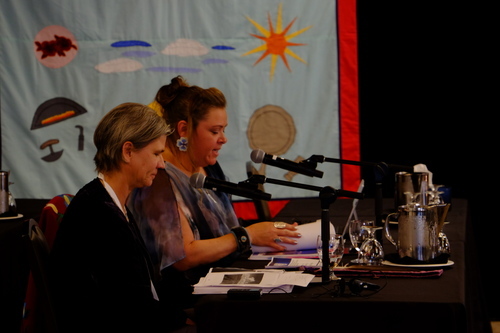 Buller asks Davidee Aningmiuq about "safe houses" in Nunavut. "There are homes in the community where children visit and feel safe," she answers. "They are not recognized, they just want to be discrete. But what we did was we started supporting them with snacks, toys for children. Just to acknowledge that they were contributing members of the community." She says the numbers of these are declining. Qajaq Robinson is now taking her turn to question the witnesses. First question is a follow-up to the question about forced sexual favours to RCMP. She asks if there was any evidence brought forward about sexual favours of the wives of RCMP special constables. Yesterday, there was a lot of discussion about special constables and what they were expected to do. "Not that I can recall reading," says Aksalnik. "But traditionally, there was a lot of sharing between families of spouses." "In Inuit society, that has happened," says Idlout-Sudlovenick. "But it was consensual. When RCMP saw this was happening, they thought it was OK. But traditionally, it was consensual. In this situation, it was not." Robinson asks if there is any orientation for RCMP officers, teachers or nurses who come into communities. Aksalnik says that QTC has been commissioned to provide orientation for community health professionals travelling to communities for TB screening. She says she can't speak for the police or teachers' association. Robinson switches to Inuktitut. She brings up Project Surname, which assigned a number to each Inuit person, and asks the witnesses to elaborate. Davidee Anigmiuq responds. "When I was born, I was named Elisapi," she says. "My name has been mispelled in so many ways. Later on, they gave me my tag number E7333. My friend, who was also Elisapi, was E7344. We were 333 and 344." "I don't remember being hurt over that, but today, some people have been disappointed in getting numbers. I don't think anyone negatively reacted to having a number, but it was the wrong way to do things." Robinson asks Davidee Aningmiuq about custom laws, and if the Inuit family system should be recognized in today's world. Yes, she answers. She speaks about different naming conventions for family relations - having different words for uncles on her father's and mother's side, for example. "We have to teach it, so it will be passed on." "We are told if you lose an older sister, a younger sister, the government should provide counselling or addiction services," says Robinson. "Usually it's on a one-to-one basis without looking at other members of the family. Do you think we have to focus on the family instead of on one individual?" Yes, says Davidee Aningmiuq. She would like to see counselling include the full family, and believes it would be a benefit to the family as a whole. European counselling systems focus on confidentiality, but in the Inuit system, it is different. You don't focus on one individual - you focus on the whole family. If you just focus on one person, they aren't going as far as they can. Robinson asks if a focus on counselling the entire family unit as a whole be included in the recommendations. Davidee Aningmiuq says that they should. "It would be a benefit for the whole family... if you only focus on one individual, it contributes to the breakage of the family." Robinson asks about the word "programs" to describe the cultural revitalization practices taking place at the centre. "It's health and social services. It's justice. It's all those services that are funded by the state, not on a year by year basis. I think that has to be changed." Davidee Aningmiuq agrees that the word "program" isn't great. "My life isn't a program." Robison tears up as she finishes her questions and thanks the witnesses. The Inuit perspectives panel's testimony is now concluded. Gifts of eagle feathers are being presented to the witnesses. 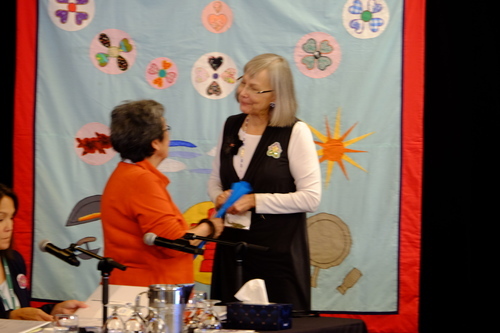 Commissioner Buller hands an eagle feather to Davidee Aningmiuq. That concludes the first panel on Inuit perspectives and we are now breaking for lunch - back at 1PM ET. We are back and getting started with the afternoon portion of today's hearing. Dr. Janet Smylie is being introduced. She will be the sole witness for the second panel, on Indigenous health and wellbeing. Dr. Smylie is a Cree-Metis physician. She completed her masters of public health at John Hopkins University, and holds a Canadian Institutes of Health Research Applied Public Health Research Chair in Indigenous Health Knowledge and Information at St. Michael's Hospital. Dr. Smylie is running through her resume to be certified as an expert. It's extensive. She has presented two curriculum vitaes - coming in at about 75 combined pages. She's published over 100 peer-reviewed publications and has spent her career focusing on addressing inequities in the health of Indigenous people. Dr. Smylie has been to Iqaluit twice before, she says. She's also worked with the Inuit community in Ottawa at the Inuit Family Resource Centre. Dr. Smylie, left, is certified by the commission as an expert in the field of Indigenous health and as a junior knowledge keeper. Dr. Smylie begins her testimony by giving her family background. "It's important because any knowledge I share is a collective effort." She is now speaking about the Well Living House, a hospital-based research unit that focuses on Indigenous infants and children. The House has a Memorandum of Understanding with a grandparents' council, the only one in Canada for a hospital research unit, she believes. Dr. Smylie is now moving into the core of her testimony. She's planing to focus it as a strength-based testimony: "I think we've heard a lot of the problems already, and I think this is what I can bring." "We are who we imagine ourselves to be," a quote reads on Dr. Smylie's presentation. She speaks about self-defeating stereotypes among Indigenous health such as diabetes and alcholism. "But what if we imagine ourselves richly?" She says. "Not only are we faced with different approaches: one that we have to change the machine, and one that we have what we need, we also have to deal with differing worldviews. My ancestors aren't just going back to Ireland." She says the answer lies somewhere in between these two approaches. Dr. Smylie speaks about the difficulties starting out as a Metis physician - in particular the dichotomy between research knowledge and traditional knowledge. She says there is a place for both. "We just have to match the knowledge system to the problems that we're facing." Dr. Smylie says she is focusing on peace, love and joy in early relationships. At the first meeting of the Well Living House's Counsel of Grandparents, she was told to focus on early relationships. "If we get those right, we should be OK."
Her thesis is that high quality early relationships lead to love, security, and a sense of belonging. That leads to self-worth and self-acceptance. Adding in a Cree-Metis perspective, she says that a major element of this is to understand your connection to a larger web of family, community, and land. This includes focusing on your own wellbeing. "I'm not good to anybody if I'm just running around." Dr. Smylie says that includes managing emotions, as well as teaching it to others - managing "big feelings." "We have lots of big feelings in our family," she says. This also extends to taking care of the land. Tying it back into research medicine, Dr. Smylie says there are studies that show that neglect and a lack of love can lead to long-term mental health problems. One of Dr. Smylie's first research projects was to find a way to spread pre-natal information among Inuit communities, she says. She had an elder from Arctic Bay, Nunavut come to Ottawa and record videos in Inuktitut for expectant mothers. In essence, Dr. Smylie's argument is that early life supports and wellbeing are essential to long term mental health. It seems like this is where she will be focusing her testimony.